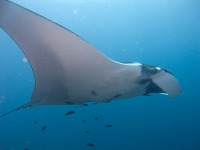 Manta Ray (Manta birostris) at Hin Daeng, Thailand. Manta Rays are a large genus of flattened fish. Manta Rays are closely related to cartilaginous fish such as sharks. Some manta rays reach up to 7 meters wide. There are two species of Manta Rays. Both species of Manta Rays are considered vulnerable. Manta rays are the biggest of all rays. Manta Rays eat by filtering plankton from the water. Manta Rays evolved from bottom feeding rays.